Why Do You Need A Carving Knife? What makes the Flexcut KN20 chip carving knife so great is the engineered quality and simplicity in its design. Flexcut had the perfect product vision when designing this knife. The design starts with the short traditional shaped blade that comes razor sharp out the box. The high carbon steel blade is the perfect shape for making triangular cuts for intricate and detailed geometric designs. The blade also works with you by being seated perfectly to work with the wood when held. The resulting blade position brings the point to chip into even mahogany like butter and leave behind clean, perfect edges. The sharpness of the blade makes it a joy to use and create chip carving works of art with. What good is a knife if its handle is rough, abrasive and leaves you sore at the end of the day? I’ll answer that for you: that knife is no good. That’s why the Flexcut chip carving knife has an ergonomic ash handle that fits in your handle comfortably. The ergonomic design makes it a pleasure to chip carve with this knife. The handle is designed to reduce strain on your hand by fitting along your hand’s natural bone structure. Working the knife feels very natural and when combined with the blade that chips away at hardwoods like butter, this knife is a true dream to use. The handle is ambidextrous in design too, so left-handed people can rejoice in know that they will confide in the same comfort as right-handed people when using this knife. I will say that the finish on the handle could be better. I’ve used previous Flexcut tools and they came with a better finish on them. It seems to be hit or miss as maybe a few knives make it through production with a subpar finish. If the ash handle is too rough for your liking, I would sand it with a fine grit sandpaper and apply linseed oil for a superior finish. This is the only real downside of the knife I found. Overall, the lexcut chip carving knife is a quality tool fit for a true craftsman. The sharp blade, ergonomic handle and ambidextrous design make it a joy to work with. This blade is fit for chip carving beautiful intricate designs into hardwood and any chip carving enthusiasts would be happy to own the best chip carving knife. If you find yourself frequently chip carving and don’t already have sharpening setup, I would recommend you pick up Flexcut’s slipstrop and gold polishing compound. They’ll keep your edge sharp and ready for service in case you ever notice your blade dulling and want more precision. If you’re in need of a chip carving knife set, look no further than Flexcut’s chip carving knife set. I chose Flexcut’s chip carving knife set as the best chip carving knife set because of their great design, sharp blades, ergonomic design and simplicity to use. The chip carving know set comes with three different blades. The main knife is Flexcut’s original chip carving knife which is the same model as the review above. The other two knives that I’ll review are the mini chip carving knife and skew knife. The standard chip carving knife is great for general chip cuts and is a joy to work with. The handle is ash and is ergonomically designed to reduce strain on the hand. The high carbon steel blade comes sharp out of the box and can take on hardwoods such as mahogany to create intricate patterns any skilled craftsman would be proud of. The mini chip carving knife is perfect for extremely precise and intricate chip cuts. The sharp high carbon steel blade is great at make intricate cuts into wood. The handle on the mini chip carving know is made from ash and sanded to a smooth finish for comfort. Also on the handle of the mini chip carving knife is a thumb relief to relieve hand stress and pressure from making intricate cuts. The mini chip carving knife is a perfect detail work tool that complements the regular sized chip carving knife well. For cuts that require extra precision, you can count on the mini chip carving knife to help make your art beautiful. The third tool in Flexcut’s chip carving knife set is the skew knife. The skew knife has an ash handle that has been sanded to a smooth finish similar to the other tools. The blade is made from high carbon steel and comes razor sharp out the box. The skew knife is perfect for making vertical cuts, especially when work space is limited. The pointed edge and sharp blade are perfectly angled to aid you in making vertical cuts. 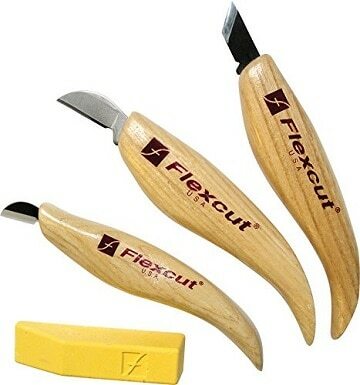 As an added bonus, Flexcut includes their gold polishing compound with the chip carving knife set. If you already own a slipstrop you can use the good polishing compound to keep your blades honed. If you’re in need of a slipstrop, I’d recommend the Flexcut slipstrop to easily maintain and keep your blades in top condition. Overall the Flexcut chip carving knife set is the best chip carving knife set because of its simple yet effective and high quality knives. The high carbon steel comes sharp out the box. The ash handles have a great finish and are ergonomically shaped to reduce hand stress. The utility of the tools will be appreciated by any craftsman. They are truly a joy to own and my personal recommendation for chip carving enthusiasts. Having access to a detailed and thorough chip carving book helps you learn more about proper form and new designs. A high quality chip carving book will have detailed instructions and multiple projects to practice. My recommendation for the best chip carving book would have to be The Complete Guide to Chip Carving by Wayne Barton. The book covers everything you might want to know about chip carving in one detailed and highly illustrated book. 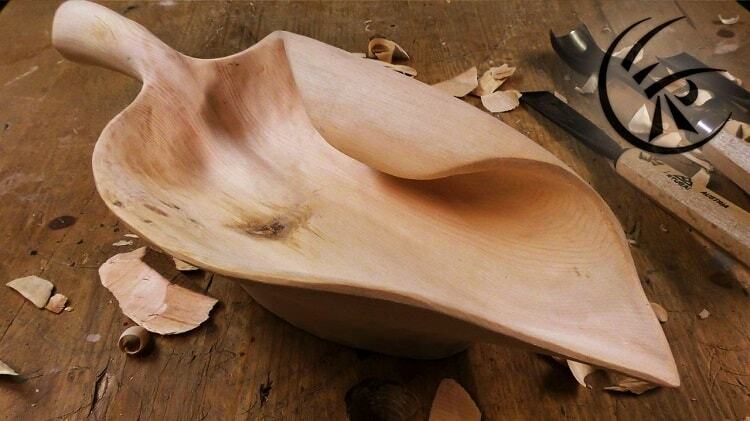 Wayne Barton is credited with a large resurgence of the chip carving craft. His knowledge and instruction abilities are second to none when it comes to chip carving. You’ll feel right at Wayne’s hip as he shows you how to sharpen your tools, teaches your proper technique and shows you his favorite designs. My favorite parts of the book are the highly detailed pictures that Wayne uses as he walks you step-by-step and gives helpful tips on design projects in the book. This book is a one of a kind lesson from a master chip carver. The high quality information and photographs inside will go appreciated by chip carvers new and experienced alike. You cannot go wrong buying this book if you’re looking to enhance your chip carving craft. Choosing the best chip carving knife for your woodworking projects is crucial. We’ve chosen the Flexcut chip carving knife as the best chip carving knife for several reasons. 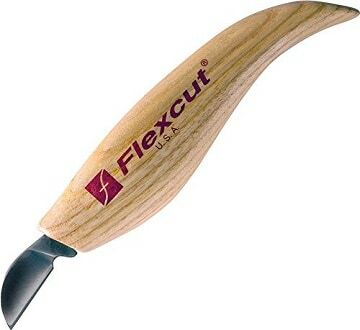 The Flexcut chip carving knife has a high carbon steel blade that allows you to make more precise chips and create more intricate detail on that piece of pine, basswood, butternut or mahogany. The Flexcut chip carving knife’s ash handle also relieves hand stress from chip carving thanks to its comfortable, ergonomic design. If you’re looking for the best chip carving knife set, we’ve chosen the Flexcut Chip Carving knife set that you can read about below. As a bonus to our readers, we’ve also reviewed the best chip carving knife book that’s filled with great fun projects by a master instructor. Feel free to write up your experience with carving wood.